Not every entrepreneur’s prescription for success is exactly the same, but there are often many ingredients in common: a novel idea, a vision of success, hard yards, a dash of luck and a carefully cultivated network of advisors, mentors, investors and other champions. David Zuleta—while still a neuroscience and biotechnology undergraduate in the College of Arts and Sciences—is skillfully combining these ingredients to develop ModoScript, a digital prescription dosing system that he hopes will combat prescription drug abuse, boost patient compliance, cut medical costs and disrupt the medical device industry. 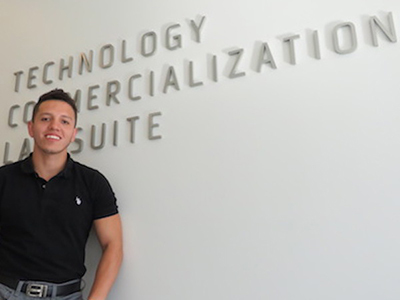 With the help of the College of Law’s New York State Science and Technology Law Center (NYSSTLC), Zuleta’s vision is coming into focus and his network growing as he moves ModoScript from the concept stage toward prototyping and eventually the marketplace. In order to effectively control pain and keep patients from abusing prescription medications, Zuleta conceived a tamper-proof, “smart” dosing system to better regulate the flow of opioids, stimulants and anxiolytics. He hopes to combat the ongoing epidemic of drug abuse from the root, while reducing costs associated with patient non-adherence, overdose, under-dose and prescription trafficking that the healthcare industry must deal with. ModoScript’s digital health system combines an automated, “pill-safe” dispenser with a mobile application to connect several sectors of the healthcare industry. A patient prescribed controlled medications will be required to use the pill-safe dispenser provided by a pharmacy. The dispensers are fitted with biometric safety locks to combat abuse and ensure proper patient compliance. Zuleta says there are other safety pill dispensers on the market, but ModoScript differentiates itself by being a business-to-business platform that will be sold not directly to patients but to insurance companies tackling the opioid abuse epidemic. ModoScript aims to lessen the paperwork load on doctors (by integrating seamlessly with electronic medical records, for instance) and to lower costs for insurance companies, “while providing pharmaceutical companies with a tool that will help them improve clinical trials in hopes of developing safer medications for patients,” says Zuleta. In July 2017, ModoScript was the only student startup winner of the Medical Device Innovation Challenge (MDIC), sponsored by the Upstate Medical University’s Medical Innovation and Novel Discovery Center (Upstate MIND). NYSSTLC Director M. Jack Rudnick led the committee of experts that judged entries. This fall, Zuleta became one of NYSSTLC’s semester-long projects. Under the guidance of Professor Chris Horacek—and with help from third-year research associates Lindsey Round and Jennifer Hicks—the law center is helping Zuleta with patent, intellectual property (IP) and market landscaping; information on U.S. regulations and the Food and Drug Administration submission process; and business development issues, such as vesting agreements. The team that Zuleta has built in a short time is impressive. It is made up of regulatory experts, angel investors and a mentorship board, while advice also is coming from the CNY Biotech Accelerator, Empire State Development, Microsoft BizSpark, Syracuse University’s LaunchPad Blackstone, the Couri Hatchery, the Tech Garden and others. To develop the prototype, Zuleta has put together a team consisting of Ph.D. mechanical, biomedical and computer engineers from Cornell University and Syracuse University, including Jason Hooper, Yunpeng Li and lead of product development Tiffany St. Bernard. The engineering team is charged with completing a prototype by the end of November when—as an MDIC finalist—Zuleta will be asked to test ModoScript’s efficacy. An innovation challenge pitch is scheduled for December in front of high-level SUNY-Upstate principals and outside investors. Assuming all goes well, Zuleta says he is looking forward to “phase 2”: filing a patent application, further product development, building venture partnerships and working toward FDA compliance.